The Bushnell brand has been one the industry leader in high-performance sports optics for more than 50 years. Ever since the legacy started by David P. Bushnell in 1948, the Bushnell products company has continued to be known for its service. One of its principles is to provide quality, reliable and affordable sports optics products in the industry. Bushnell product aims to enhance the enjoyment of outdoor activities not only for hunting activities but also for other purposes. It lives up to its legacy of having its camera’s battery life last for a long time and providing the quality experience to its customers. Its Trophy Camera is designed to capture several thousand images before the batteries run out and provide images with sharpness and clarity in it. 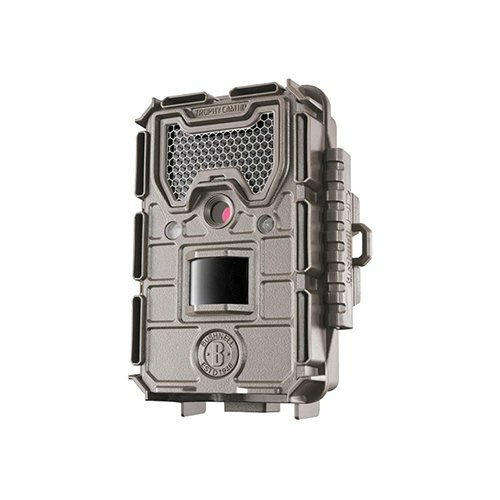 This Trophy Camera features an adjustable setting which allows the user to capture one to three images per trigger, and anywhere from five to 60 seconds of video one at a time. Users can adjust the trigger interval anywhere from one second to 60 minutes to capture a perfect shot of animal movements. 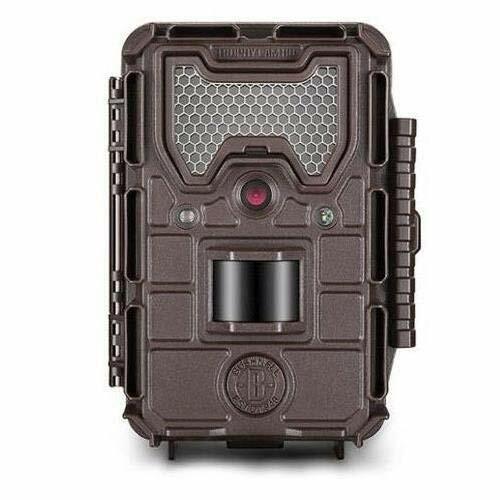 This game trail camera is capable of 16MP resolution images with an auto day and night sensor. This feature allows the camera to identify what particular type of image is needed at that specific time of the day. The camera’s battery life can last up to 12 Months on one set of batteries. The camera also enables data stamp where every image taken embeds the information about the date and time it was taken. The camera also has a double time-lapse technology which allows it to automatically snap photos at preset intervals of one minute to an hour which monitors both dusk and dawn movement. It records video with a 720p resolution along with an audio recording and features a hyper night vision mode. This creates a quantum leap in distance and brightness that ensures sharp after-dark imagery. 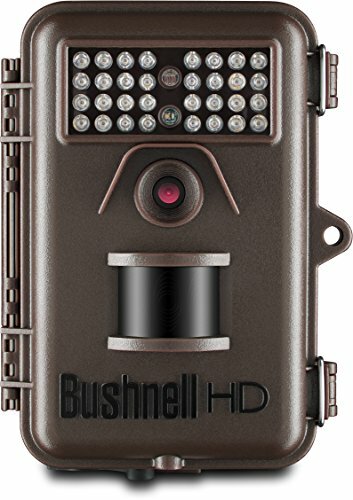 Unlike other Bushnell brands, this camera does not feature a hybrid capture or its ability to take a still image followed by a video. There can be difficulty in extracting the batteries out of the camera. This serves as an idea for users to build some patience and bring out some tools in removing the batteries out of its compartment. In the moment of hunting, there can also be problems with its flash. The red glow can be visible which could cause targets to be aware of what’s around them during hunting time. This camera features an 8-megapixel Night Vision mode along with an invisible 32-LED flash for all-day game scouting. It has a 45-foot PIR motion triggered sensor and flash range that captures the subject in motion at quick speed. It features a Field Scan time-lapse technology which allows the user to preset automatic image capture intervals and provides frame skips that capture motion of the target. It produces images with a full-color resolution during the daylight and black and white at night. This camera is also capable of taking widescreen, VGA, and QVGA and capturing videos of up to 60 seconds with an audio recording. It is compatible with a 32GB SD card. In taking images, this camera captures 8-megapixel individual still images, and multi-frame images of up to three shots that provide excellent coverage of every game movement. There may be tendencies wherein you need to adjust the position of the camera to get a clear shot of your moving subjects, or the images could be a bit inaccurate. If you are thinking of using this camera for surveillance, there can be a problem with its IR flash which is quite visible as dim red and can be noticed by animals or people roaming around your area. Overall, this camera is designed for professional hunters in action. 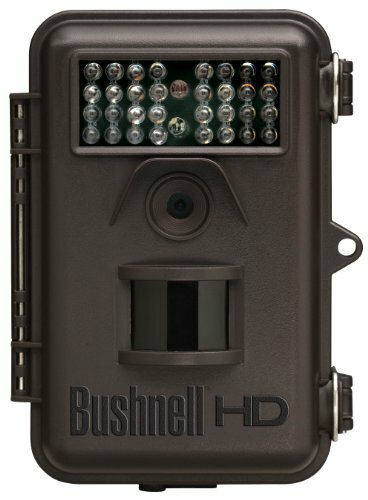 The Bushnell Trophy Cam features adjustable images per trigger where it varies from 3, 8 or 12MP full-color resolution. It has a day and night auto sensor which captures moving targets at a quick time and activates out to 80 feet. Its trigger speed is that of .3 seconds which makes it possible to obtain moving targets quickly. Its PIR motion sensor can also be adjusted from Low, Medium or High depending on the range of the sensitivity rate the user wants to have it. Its video recording length can capture from 5 seconds to 60 seconds, programmable and has a double field Scan time-lapse mode which takes images at pre-set intervals, 1 minute to 60 minutes. It has an estimate of 1-year battery lifespan which makes it fit for hunting activity and has a hyper night vision feature which makes after-dark imagery clear. It captures moving objects accurately but can be a bit sensitive at times. This sensitivity results in the inaccurate capture of subjects especially when it detects moving objects just like waving plants. This problem can be fixed by placing it somewhere that unnecessary movements cannot be detected by the auto-sensor of this camera. Avoid placing it where it is surrounded by leaves to maximize its potential. Night video is limited to 15 seconds. 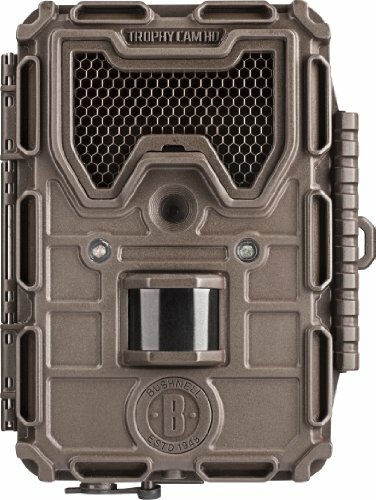 The Bushnell Trophy Cam HD with Night Vision (RealTree AP Camo) is a digital scouting camera. It can be used for surveillance, wildlife monitoring, and scouting game. It provides 8MP full-color resolution images and now features 720p HD video with audio recording. It has a Passive Infra-Red (PIR) motion sensor which can reach up to 60 feet and boasts a 0.6-second trigger speed compact with high motion sensitivity. Its auto-PIR monitors the surrounding temperature conditions and automatically regulates the trigger signal sensitivity based on the current temperature. It is equipped with 32 LEDs that function as a flash for night vision mode. This allows the camera to capture images in darkness with a range of 60 feet. The camera also features a Field Scan time-lapse mode which takes images at pre-set intervals. The camera will take photos or video clips automatically at the user’s choice of ranges, without the requirement of the normal trigger. The case with the battery compared with other Bushnell brands is that it is only capable of lasting up to 5-6 months. When it comes to using the night vision mode, try to test some sample images that the camera would capture. There are tendencies that pictures are washed out. This way, you can adjust some parts of the setting when using the night vision mode. 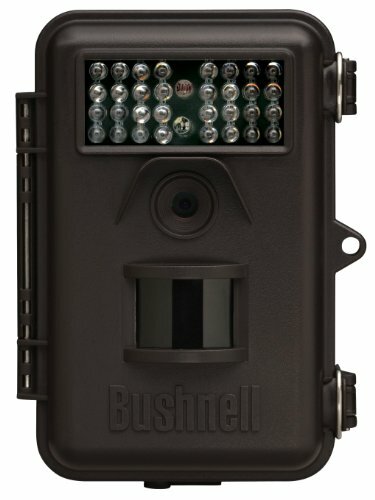 This Bushnell Trophy Cam captures 8MP high-quality full-color resolution images. It provides 1-3 images per trigger and records 1280x720p HD video. This video goes along with an audio recorder with a programmable length from 1 to 60 seconds. With its Hybrid Capture Mode, it enables the camera to capture simultaneously full resolution images and video on every trigger. Its pictures display the date, time, moon phase, temperature, and name. It has a GPS Geotag which allows it to embed GPS coordinates in the images automatically. Just like other Bushnell brands, it runs up to one year on one set of batteries (4-8 AA). The camera includes an adjustable web belt and 1/4-20 socket for proper positioning of it. It has an SD Card Slot with a 32GB capacity, but it needs to be a memory card that works compatibly with it. Some SD cards do not work unless it fits the standard. When it comes to taking nighttime images, it can be evident that some may be blurry and a little vague. This is due to the relative distance of the camera from the subject or moving animal which is beyond the camera’s scope. As with other Bushnell brands, this camera works useful for hunters who take a beginning stage professionally. 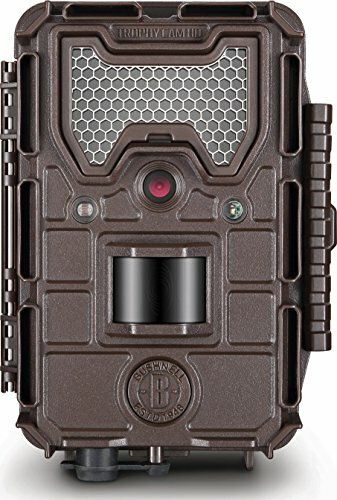 This camera is capable of capturing quality still images or 720p HD video with an audio record for a brilliant wildlife monitoring. It features a Hybrid Capture Mode which allows it in capturing full resolution images and video simultaneously at each camera trigger. Video length can be programmed and can record up to 60 seconds. The camera is triggered by movement of subjects, detected by a high-sensitive Passive Infra-Red (PIR) motion sensor. This sensor can reach out to 60 feet and boasts a 0.6-second trigger speed. It also has an auto PIR sensor mode which allows the user to maximize consistency in all conditions. Auto-PIR monitors surrounding temperature conditions, and it automatically activates the trigger signal sensitivity based on temperature. The camera is equipped with 32 built-in infrared No-Glow LEDs that function as a flash. This enables the delivery of photos or videos in full-color resolution during daytime and in black & white after dark. The No-Glow “black” LEDs are invisible to wildlife which is appropriate for hunting. These LEDs are capable of 60-foot flash range, a quantum leap in distance and brightness which allows sharp dark imagery. The camera is estimated to operate the whole day and has a Field Scan time-lapse mode which takes images at pre-set intervals. This Trophy Camera consumes very little power (less than 0.2 mA) in a surveillance state which makes it last for 6-12 months. It can happen when the camera captures blank images which have no animals in it. It can be due to high motion sensor which detects unnecessary movement. Better place it somewhere with no disruptions of motion detection to preserve memory and power. With regards to detection, it is only capable of reaching up to 30 feet so expect that not all animals roaming around the area can be detected with the limited range. This Trophy Camera captures images with an 8MP high-quality full-color resolution. It captures 1-3 images per trigger. Each trigger runs about 0.6-second trigger speed. It also records videos of high definition with 1280×720 pixels with an audio recorder that can be programmed from 1060 seconds. It has a day and night auto-sensor which makes it capable of being used for hunting the whole day. Its PIR motion sensor can be adjusted from Low, Med, High or Automatic. This enables the user to use which sensitivity rate would be reasonable. Daytime photos are excellent and have crisp and sharpness in it but can be blurry for nighttime photos due to having no specific feature for the nighttime mode. The camera has a Field Scan time-lapse mode which allows it to take images at pre-set intervals, 1 minute to 60 minutes which can also be programmed. The camera can run up to an estimate of one year on one set of batteries. It also has an adjustable web belt and 1/4-20 socket if you would like to attach it to trees, walls or polls. Its structure is precise and robust, just designed to be weatherproof to make it stable at any elements. There may just be some problems that MAC users would encounter. Videos that this Trophy Camera record is in AVI format, so users still need to purchase a video converter to play recorded files on their device. 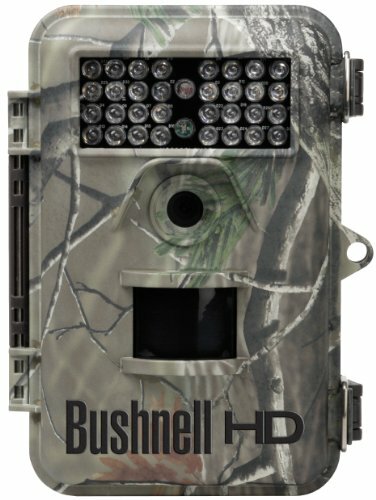 This Bushnell Trophy Camera captures standard quality images of 12MP. It is a compact game camera with a multitude of photo and video settings. Resolution size can be adjusted at 3, 5, or 12 MP. It features a 0.3-second trigger speed that quickly snaps photos of targets in quick time. Videos recorded by the camera are at a 720p resolution and can run up to 60 seconds in length. It goes along with an audio recording of the video. The camera runs with (8) AA batteries and is estimated to function with the first set for about a year when used only for surveillance. It uses low-intensity infrared to capture images to avoid alerting the prey. When the camera takes images, it stamps information about the moon phase, barometric pressure, date, time, and temperature at the time the photo was taken. The adjusting of this embedded information cannot be adjusted especially the time if you want it in military mode or not. The camera is designed to work both daytime and nighttime. Images during daytime are clear and sharp when subjects are stationed and not moving at all. It deals a hard time once the target moves aggressively and would turn out the image to be blurry, It is the same with nighttime images that are dim and vague when taken. The SD card slot of this camera works compatibly with 32 GB memory card. If the user is a beginner in the field of hunting, this camera works perfectly in gaining experience. This trophy cam is designed with a removable ‘ARD’ anti-reflection LED cover. It is designed with a cable lock channel and a latch for maximum ruggedness. This camera is capable of 14MP images with a 0.2 trigger speed for quick capture. During nighttime, this camera features an extended nighttime photo range within 30 ft. field vision. It features a double Time-lapse technology which automatically snaps images at preset intervals of one minute to one hour that monitors both dusk and dawn movement. The camera’s simultaneous live trigger will still capture images of anything that passes through it. It can be within the hours of the user’s choice. The camera also features a Hyper Night Vision mode where there is a quantum leap in distance and brightness that ensures sharp after-dark imagery. The battery life of this camera can last up to 12 months with the first set of 8 AA lithium batteries. The camera was able to extend its photo range during nighttime, but still, it had problems in dealing with blurry images. It takes pictures within a wide range but can be vague and inaccurate if it is used as surveillance. When monitoring the surroundings for capturing photos of roaming targets beyond the normal range, it can be unclear. Its motion sensor also has no sensitivity adjustments which sometimes can cause false triggers that capture blank images. 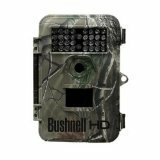 The Bushnell Trophy Cam Essential features multiple function system which is specifically designed for hunting activities. It includes 32 low-glow LEDs, a 6MP camera, video mode and Field Scan technology. It has a Motion Sensor and Hyper Passive Infrared Sensor (PIR) which allows detection of heat temperature and motion to trigger the camera to take an image. These sensors are capable of reaching out to 45 feet and boast a 0.8 second trigger speed. It has an after-dark imagery which is ensured by a quantum leap in distance and brightness. It includes Low-glow LEDs which act as its flash to capture black and white images in low light conditions. An additional feature of this camera is that it is equipped with Field Scan 2x time-lapse technology that automatically captures images at preset intervals within up to two-time frames. This tool allows the user to monitor dawn and dusk automatically. This camera is powered by Powered by 8 AA batteries. This Essential Trophy Camera is capable of running in an estimate of one year on one set of batteries. It is capable of handling a 32 GB SD card which can take up to 20,000 images. The camera’s exposure system can somehow be weak, especially when placed in a location where it is surrounded. There can also be difficulty in detecting small organisms such as rats, so better place it where everything is clear and no additional object can block its scope of detection.